Insulating concrete forms (ICFs) are expanded polystyrene panels that are stacked into the shape of the exterior walls of a building. Steel rebar is installed as the panels are stacked. Concrete is then poured inside, creating a foam-concrete sandwich. The result is a house or commercial building that is exceptionally strong, energy efficient, quiet, comfortable, and durable, that can be built in any style. 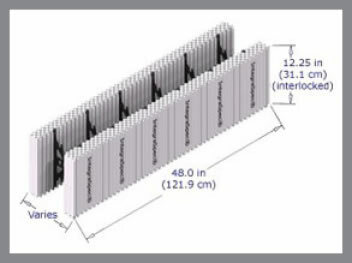 IntegraSpec® is an Insulated Concrete Form (ICF) consisting of 2 panels of expanded polystyrene (EPS) married with high impact polystyrene inserts used to hold patented webs/ spacers designed to secure rebar as needed. Once stacked together, these forms represent a mold ready for concrete placement, similar to a traditionally poured concrete wall; however, ICF forms never leave the concrete. Does building ICF structures take longer?